Breaded fish fillets can be delicious, but breading adds calories and carbohydrates to a lean source of protein. If you prefer your fish without those extra calories or carbs, pan-searing and blackening techniques produce a delicious fillet that remains tender and flaky. Catfish is a natural choice for pan-searing because its relatively firm flesh stays together in the pan, while its mild flavor acts as a neutral carrier for bolder flavors. Heat a skillet over high heat. A cast iron pan works especially well, but any pan will work. If you use nonstick cookware, turn down the heat to medium-high because very high heat — hotter than 500 degrees Fahrenheit — can affect the nonstick surface. Sprinkle the catfish fillets with a spice mixture or dry rub of your choice. Prepared spice mixtures range from spicy styles to mild but flavorful blends; any of them will work equally well, so let your taste buds be your guide. Add just enough oil to the pan to coat the bottom of it. Choose a high-temperature oil such as peanut, safflower or corn oil over lower-temperature oils such as extra-virgin olive oil to avoid imparting a scorched flavor to the fish. Set the spiced catfish fillets in the hot pan and let them sear for about three to four minutes depending on the size of the fish. Flip the fish fillets with a spatula and cook them for another three to four minutes on the other side. The fish will let you know when it's ready to turn by releasing easily from the pan, so if your spatula sticks when you first attempt to turn the fillets, let them cook another few seconds before trying again to flip them. Remove the fish fillets from the skillet with the spatula and serve them immediately. Unlike meats and poultry, fish does not need to rest after cooking. Top catfish fillets with a sprinkle of crushed pecans or almonds for a crunchy coating. Blackened fish requires butter to develop its characteristic dark color. If you want to try blackened catfish, drizzle melted butter on the fillets before applying the spice rub and leave the oil out of the pan. Keep raw and cooked catfish fillets separate in your kitchen to avoid cross-contamination. Catfish are bottom-feeding fish, so they require thorough cooking for safety. 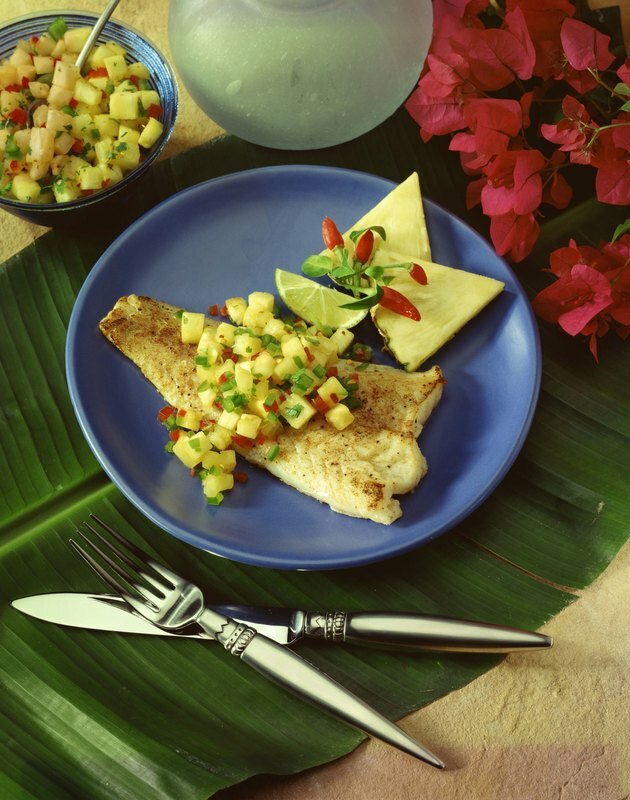 Blackening fish creates smoke, so try this recipe outside or with strong ventilation indoors. Is Baking or Broiling Better for Fish?